At the heart of every conference room system is a computer. 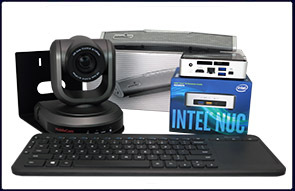 The computer functions as the backbone of the system because it allows a user to connect all other components for audio and video conferencing. We generally advise having a dedicated PC for conferencing, live streaming, or recording, as it provides a stable and consistent platform for interaction and operation. 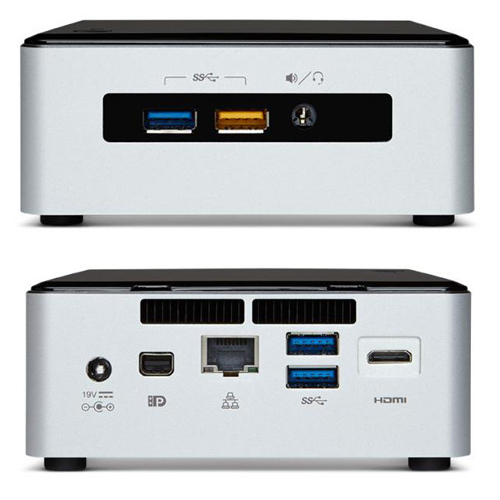 Our main recommendation is the Intel NUC set of micro-PCs. Those units provide a small form factor (e.g. the i5 model is currently measured at 4.59¨ x 4.41¨ x 1.55¨) making them perfect for discrete installs and allowing them to be mounted directly to the wall or even behind a TV display. This also reduces the need for extended cable runs between the conference camera and the PC. For control of the computer, we suggest using a wireless radio frequency (RF) keyboard with a touchpad, such as the Microsoft All-in-One Media Keyboard with Built-In Multi-Touch Touchpad. The conference camera has become a staple of the modern meeting by providing participants with the feeling of direct, person-to-person interaction. This leads to more engaged and productive meetings, while simultaneously reducing or completely eliminating the need for costly and time-consuming travel. 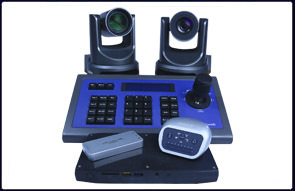 The same conference cameras can also be used for a wide variety of live streaming, broadcasting, and recording scenarios, such as a production studio, live performance, presentations, or house of worship. 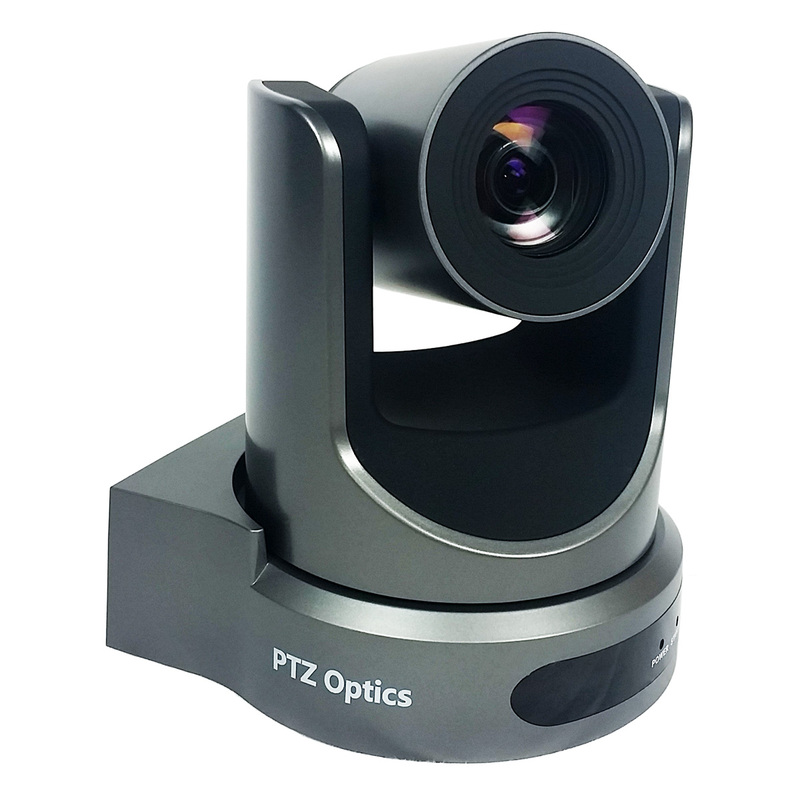 When selecting a conference camera, it is important to make sure that it matches your needs by providing an appropriate field of view (FOV; generally reported in degrees) and optical zoom (lossless zoom; generally reported as a multiplier, such as 10X for 10 times optical zoom). We offer a broad selection cameras to match the specs and budget for nearly any project, ranging from our entry-level HuddleCamHD 3X to the higher-end PTZOptics 20X-USB. Mounting options include ceiling, tripod, and, preferably, a wall mount. For web-conferencing, the camera should be placed closed to eye-level, beside, above, or below your display, as it provides the most natural look and feeling for remote participants. 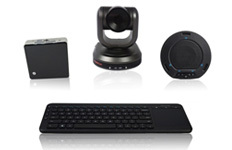 A table-top speakerphone, such as the Phoenix Audio Spider USB and Smart Interface, is normally the easiest style to deploy. Those units can also be daisy-chained to increase the audio pickup coverage range. 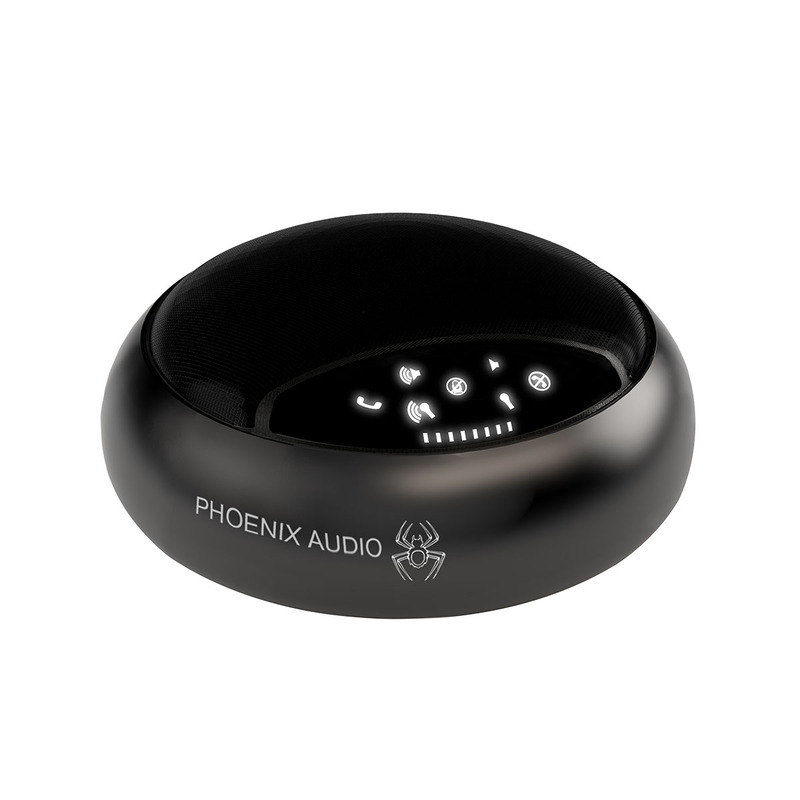 Other models within that product line, the Phoenix Audio Spider USB and Analog Telephone and the Phoenix Audio Spider USB and SIP/IP Phone, also provide the ability to connect an analog or digital SIP telephone line respectively, for standalone audio conferencing or even bridging a remote participant into a web conference. The HuddlePod Air Wireless USB Speakerphone is another easy to deploy option, while also eliminating the need for messy wiring or cable runs. The unit is simply placed on the table and a wireless receiver is connected to the PC. The wireless functionality relies on RF communication, which provides a stable and consistent connection for audio input and output. Unfortunately, this unit is not able to be expanded or used with multiple units, which limits the audio pickup range to 8-10 ft.
For large spaces or scenarios involving many participants not seated near each other, we would recommend a more advanced system, such as the Vaddio EasyUSB Ceiling Microphone Kit. This unit comes with a pair of pendant microphones and two Bose speakers, which tie back to a Vaddio EasyUSB Mixer Amp and, subsequently, a direct USB 2.0 connection to a PC. 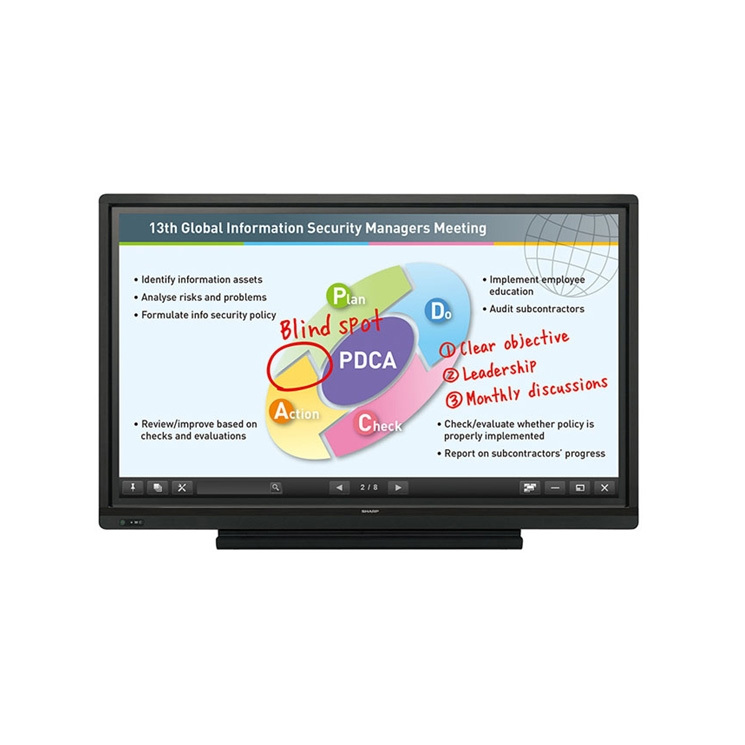 A display provides the user with a space to visually interact with their PC and operate their meetings. While many meeting rooms already contain a display, it is valuable to consider the benefits of a touchscreen display, for example the Sharp Aquos Board PN-L603B 60" Touch Screen Monitor. This model features a whiteboarding software and the ability to annotate live over top of any content or program, which can be saved as needed. This is helpful for both web-conferencing and internal discussions. Further, it allows the presenter to move, change, and develop content without the need for a keyboard or alternative controller. Thank you for reading this article. Please feel free to view our other available guides for additional information. by phone, 610-518-2200, or by email, sales@conferenceroomsystems.com.